Here are the Important Numbers to Know about Kentucky. As always, information comes from Pomeroy's Scouting Report and Game Plan. We're going to change up the format a bit because it's the NCAA Tournament -- note that earlier we did a sweep around the Internet to catch all of the day's best media updates. Overall Pomeroy Rating of 61. That's one of the lowest for any at-large team in the NCAA tournament. Adjusted tempo of 63.9 possessions / game (#281 in the country). 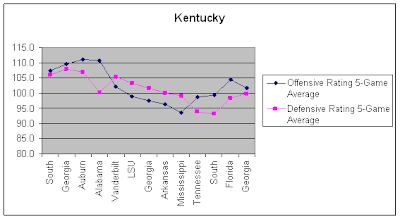 Kentucky does well at eFG%, but how well they do offensively also depends on their ability to offensive rebound and prevent their opponents from getting to the line. Both areas are relatively weak for Kentucky. Although it's not correlated with their offensive efficiency, Kentucky is also one of the best teams in the country at getting to the free throw line. They shoot a free throw 30.3% of the time that they take a field goal attempt (#25 in the country). Marquette is #264 in the country at preventing our opponents from getting to the free throw line. Kentucky's eFG% defense is actually very strong (more on this in a bit). However, just like offensive efficiency, their defensive strength comes from a weak area of forcing turnovers. Note that their ability to prevent opponents from getting to the free throw line affects both their offense and their defense. Marquette must get to the free throw line! The Wildcat's eFG% defense is anchored by an exceptionally strong ability to limit 2-point field goals (#17 in the country) and to block shots (#33 in the country). If this sounds familiar, it's because it is similar to the strengths of Georgetown, Louisville, and Connecticut. Combined with the free throw rate and yes, those are warning bells going off. The areas where Kentucky is strong are areas that Marquette has struggled this year. The key difference between Kentucky and the previously mentioned teams is that Kentucky also has a lot more exploitable weaknesses. Kentucky turns the ball over on more than 23% of all possessions (#291 in the country). That is sweet, sweet music for Marquette. Kentucky is mediocre at limiting opponents' offensive rebounds (#141 in the country). Although MU's OR% has been up and down this year, we are still #27 in the country, and our performance was very strong in the BET. As previously mentioned, Kentucky does a poor job of limiting opponents from getting to the free throw line. They also do a poor job of forcing turnovers and offensive rebounding. Basically, the game will come down to how well Marquette forces turnovers/gets offensive rebounds vs how well Kentucky does at forcing a half-court game and preventing easy 2-point baskets. How has Kentucky been Trending? Here's a view of how Kentucky has been trending since the start of conference play. Conventional wisdom is that Kentucky has been playing well lately based on a record of 7-3 in their last 10 games. However, their offense and defense run in parallel paths. In other words, when the offense gets better, the defense gets worse (and vice versa). For a long stretch (Vanderbilt -> Tennessee #2), their defense was worse than their offense. Teams don't win much when that happens, but yet Kentucky kept winning. Lately, their offense has been improving, but their defense has also been getting worse, although the team is still playing winning basketball. I would say that the conventional wisdom on Kentucky playing well is focusing more on their offensive improvements and less on defensive shortcomings. Keep coming back regularly to Cracked Sidewalks, where we'll have lots more analysis and media updates. There is an artcicle on a study of graduation rates among NCAA tourney teams out today. MU had the 6th best rate, tied w Villanova atr 89% of all Bball players. As a Kentuckian and a big UK fan, it's nice to see an opponent's analysis of us. Your numbers are very true and many of our wins this year were nail biters that could have gone either way. The one thing I will say about UK this year, is that despite the injuries, (Patrick Patterson, Jodie Meeks, Derrick Jasper) they have played with more and more heart as their situation grew more and more dim. They were at the worst when they were full strength and are at their best now when they are the walking wounded. I will say that we respect Marquette basketball highly and remember quite vividly the thumping Dwayne Wade and crew delivered a few years back... I cheered and cringed all at the same time when I saw our bracket placement. I am looking forward to a good game and unfortunately have not got to follow much Marquette basketball this year, but am sure they will bring their A game. I used to keep up a little as I knew David Diggs when we were children. He was a pretty great player for you all. Good Luck on Thursday!